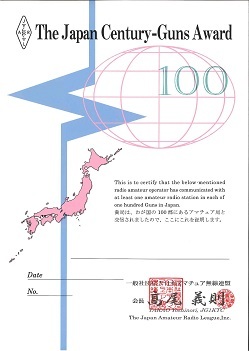 May be claimed for having contacted (heard) and received a QSL card from an amateur station located in each of at least 100 different "guns" of Japan. JCG-200, 300, 400 and 500 will be issued as separate awards. A list of QSL cards should be arranged in order of JCG reference number, however names of "gun" may be omitted. An additional sticker will be issued at every 50 contacts like 150, 250, 350, 450, 550 guns. Japan has, as administrative districts, 47 prefectures, which are divided into cities, towns and villages. "Gun" not being an administrative district, is a regional congregation of towns and villages.